Brenton Bushbuck Lodge - Brenton-on-Sea Accommodation. Brenton-on-Sea is a friendly and safe neighbourhood, where you will frequently encounter free-roaming bushbuck. Although the apartment doesn't have sea views, these can be enjoyed from many viewpoints, including the well-maintained Fisherman's Walk, a pathway which extends along the cliff top and which can be accessed via a pathway behind the property. Sitting on the bench placed for your convenience, this pathway offers panoramic views of the ocean. 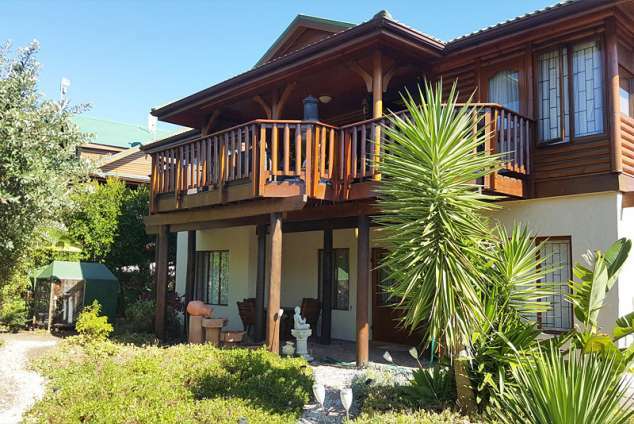 Brenton Bushbuck Lodge offers a ground floor apartment which is below the owner's main house, in the beautiful Brenton-on-sea, on the Western Head of Knysna. This 2-bedroom apartment can accommodate 4 to 6 people. The apartment takes up the bottom half of the house, the owners live in the top wooden structure. Both units are entirely separate, with no access to the apartment from the top part of the house. There are two entrances to the apartment, one via the French glass doors on the patio, into the lounge area and the other via the kitchen. The unit has an alarm which can be armed at the kitchen door entrance. The main bedroom has a king-size bed with a free-standing bath and an en-suite bathroom with toilet, wash basin and shower. The room has built-in cupboards with hanging space and shelves. There is a desk with a mirror on the wall above, which doubles as a dressing table. A hairdryer is available in the room. A ceramic panel heater provides heating. The second room has a double bed and en-suite bathroom fitted with a shower, wash basin and toilet. There is a built-in cupboard with shelves and hanging space. A storage cupboard has a counter-top and a mirror attached to the wall and is used as a dressing table. The open plan living room has a sleeper couch which sleeps two, which is available at an additional cost of R250 per night. The well-equipped kitchen features a ceramic-topped stove with oven, an induction plate, double door fridge/freezer, kettle, toaster, microwave oven and Espresso coffee machine. The open plan dining/lounge area has seating for 6 people, a comfy couch and sleeper couch, a flat screen TV, the full premium DSTV package and a DVD player. Free Wi-Fi is also available. Cell phone reception inside the apartment is limited and weak, but the Wi-Fi signal is good, so we recommend data-based calls, such as WhatsApp, Skype, Facetime or Messenger. Cell phone reception is good in the garden outside the apartment. Nature lovers can enjoy the buck, butterflies and prolific birdlife in this piece of paradise we call home. The apartment is a short walk to the Brenton blue flag beach and the hotel with its restaurant overlooking the 5km stretch of pristine beach to Buffalo Bay. There are two restaurants, a deli and a convenience store within walking distance. Detail description : Brenton Bushbuck Lodge is situated in the popular village Brenton on Sea and is within walking distance of the Brenton blue flag beach. There are two restaurants, a delicatessen and a convenience store in Brenton on Sea. One restaurant is at the Brenton Haven Hotel and has stunning views of the ocean, over to Buffalo Bay. Brenton Haven Hotel boasts a gym with a swimming pool, which is available for use on a short-term basis, catering for holiday makers. The Butterfly Blu is an a la carte restaurant with a Croatian wood-burning pizza oven. The delicatessen, also situated at the hotel offers breakfasts, pastries and coffee. Nautical South Restaurant and Cocktail Lounge is vibey and fun, offering pub-like meals and pizzas with live music on Sundays in the holiday season. Brenton on Sea can be enjoyed by the whole family. Brenton Bushbuck Lodge also offers easy access to a lovely walk, Fisherman's Walk, which extends all the way along the cliff edge with expansive sea views and access down to a private beach via a steep pathway, situated just behind the apartment. When in Brenton-on-Sea there is a sense of being away from the maddening crowd, yet it is a short, scenic drive along the lagoon to the bustling tourist town of Knysna. The Knysna Waterfront, or Knysna Quays as it is called, is home to numerous restaurants and boutique shops, which cater to most of your needs. It is also the springboard for a number of boating trips and is adjacent to the Knysna Yacht Club. Travel a short distance from the Waterfront and you will reach Thesen Islands, with its own cosmopolitan character and further boating, whale-watching and adventure opportunities. Whatever your ideal holiday preference, be it ocean, lakes, mountains or forests, Knysna is a destination that will meet all expectations. 1778 page views since 12 Oct, 2017.